High-Tc superconductors have become a hot topic in physics since superconducting mercury was first reported more than a century ago. Dense hydrogen was predicted to metalize and become a superconductor at high pressure and room temperature. However, no widely accepted experimental work has been reported yet. In 2004, Ashcroft predicted hydrogen-dominant hydrides could become a high-Tc superconductor at high pressure, due to chemical precompression. Later, Drozdov et al. observed the superconductive transition of H2S at 203 K and 155 GPa, which broke the highest Tc record. Very recently, LaH6 was reported to show superconducting behavior at ~260K. Motivated by these efforts, extensive investigations on hydrides system have been reported. PH3, a typical hydrogen-rich hydride, has attracted a great deal of research interest because of its superconducting transition at high pressure. However, structural information was not provided, and the origin of the superconducting transition remains puzzling. Although a series of theoretical works suggest possible structures, the PH3 phase under compression has remained unknown and no relevant experimental studies have been reported. In a recent research article published in National Science Review, a collaborative of scientists has presented their results on the studies of stoichiometric evolutions of PH3 under high pressure. 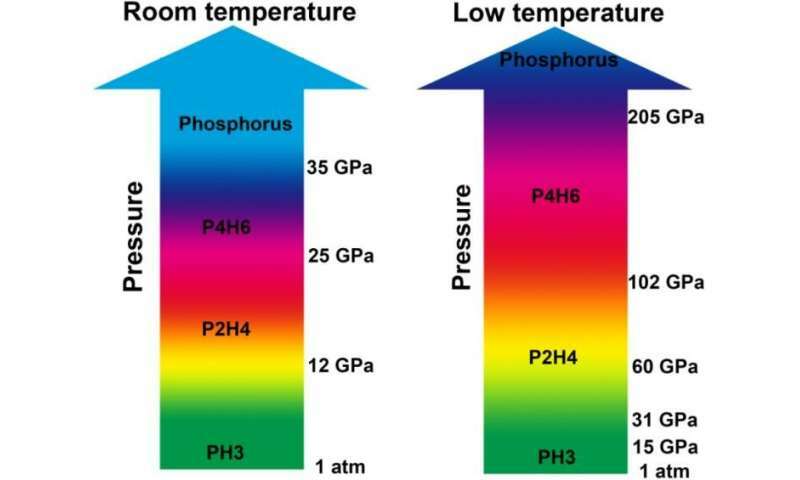 They found that PH3 is stable below 11.7 GPa and then starts to dehydrogenate through two dimerization processes at room temperature and pressures up to 25 GPa. Two resulting phosphorus hydrides, P2H4 and P4H6, were verified experimentally and can be recovered to ambient pressure. Under further compression above 35 GPa, the P4H6 directly decomposed into elemental phosphorus. Low temperature can greatly hinder polymerization/decomposition under high pressure, and retain P4H6 up to at least 205 GPa. "Our findings suggested that P4H6 might be responsible for superconductivity at high pressures," said Dr. Lin Wang, the corresponding author of the article. To determine the possible structure of P4H6 at high pressure, structural searches were performed. Theoretical calculations revealed two stable structures with space group Cmcm (above 182 GPa) and C2/m (above 182 GPa). Phonon dispersions calculations of the two structures do not give any imaginary frequencies. Therefore, this verifies their dynamic stabilities. The superconducting Tc of the C2/m structure at 200 GPa was estimated to be 67 K. "All of these findings confirmed P4H6 might be the corresponding superconductor, which is helpful for shedding light on the superconducting mechanism." Dr. Wang added.